Years ago, when I was laid off from my job, the fill in until I found a better paycheck was working as a security guard. Excitement. My duty was in a warehouse guarding suits. Men's suits. Seriously. Protecting you ladies from my hotness. I would get locked in about 5:30 and at the top of each hour make a trip through the warehouse turning a key in a fire box. The job was to make sure there wasn't a fire. These were really expensive suits. A grand or more each. I would roam around in there when I was bored and once saw a suite with the tag "Digger Phelps" on it. Yeah - I left a note in the pocket praising Norte Dame. No idea if he ever got it. Anyway, this was at the time where the wee hours of the night was not infomercials but old black and white movies on the TV. I snuck in a little portable television to keep me awake, and it was through that I found an appreciation for the older cinema, musicals, etc. I recall it was one night on either WGN or WFLD I saw "12 Angry Men". And if none of you have watched it, what the hell is wrong with you? Just do it. It's not currently streaming on Netflix or Prime, but you can find it. Or just rent it. So where am I going with this? Two weeks ago I had jury duty. You are summoned for a week in Illinois, and have to call in twice a day to see if you need to report. I only got called to the court one day - Wednesday. Within 15 minutes, my number along with 30 or so others got called for jury selection. A civil case. So instead of reading my book, I was sitting while the lawyers questioned potential jurors. When we broke for lunch (with only half of us questioned), I went out to find food. Where I stopped was just in front of a Walmart, so why not a little trip to the card aisle in the front of the store. While the Walmart near my house seems to get pretty picked through, this particular store must not have a lot of card shoppers. I can usually find some decent stuff. This was one of those days, finding a discounted blaster of 2016 Archives for just under $12 bucks. How did I do before I had to go back for my round of questioning? For starters, this was a great box for a Sox fan. 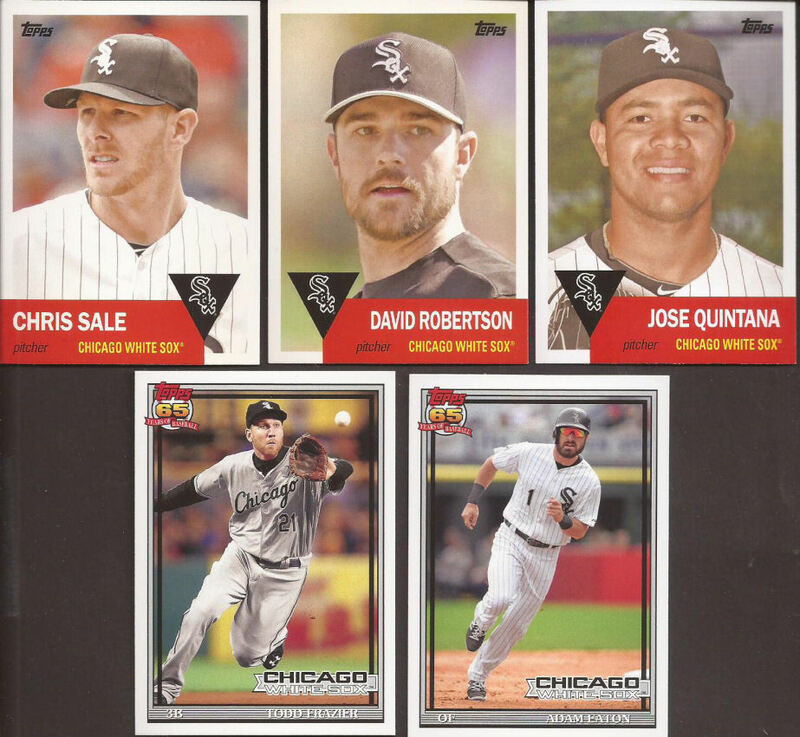 Here are all the ChiSox within. I just missed the Sox in the 1979 section of the set. Still - good haul. Speaking of 1979 (sorry Night Owl - didn't pull any you needed), this was the only card in the blaster that had a card in the original set. 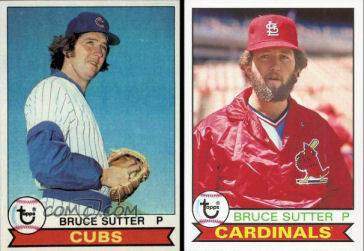 Funny they moved Sutter to the Cardinals in 2016 when he was a Cub in the original. 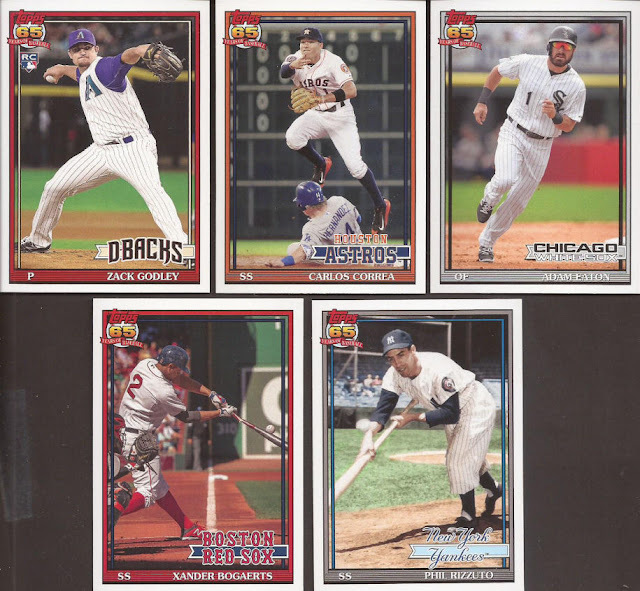 And thank goodness they did, since the Cardinals have sooooooo few cards in the set (14, for those that care). There's that Eaton again. These were all potential binder cards, except that I already have them in the binders from other packs, blasters or blogger generosity. Into the set build they all shall go. BTW - love the 50th year patch on Scooter's sleeve. Inserts. Later folks - I'm retiring on that Bryant. YEAH! There is my guaranteed Bull Durham card. Dupe, as I have Millie already. The Father and Son card is a dupe too. 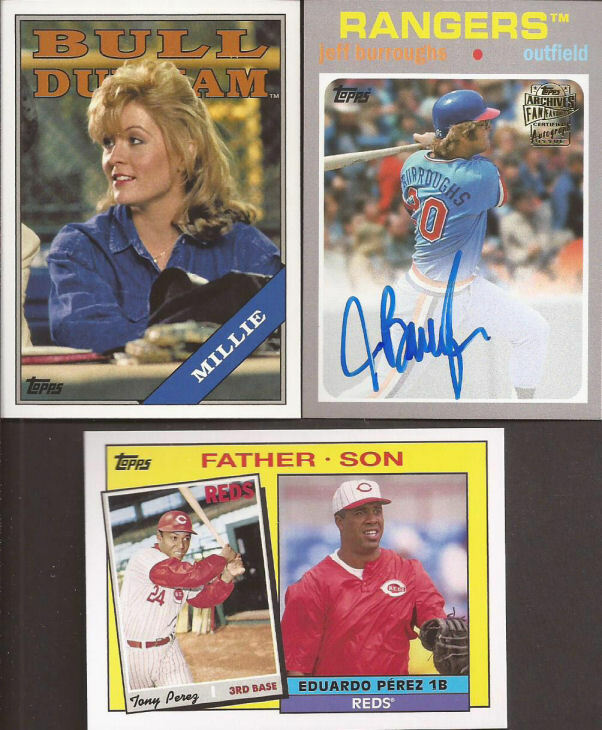 But that Burroughs auto was a hell of a nice pull. I swear that's the player name, even if you cannot see pale orange on pale gray. Good call, Topps. But funny they put Jeff on a design that is the year PRIOR to his rookie card. Might not have gotten the full $12 worth, but it was a fun rip and I got some good set filler. And I wasn't selected for the trial. Makes me one for two on juries. I still think that Zander Bogaerts from last year is one of the best from 2016. I love the colors and the shot of the 3rd base line is wonderful. I think my favorite would be the Rizzuto. Interesting photo. 12 Angry Men is a terrific movie. Great call. I've watched it again in the last half year or so but I can't remember who ran it. I had no idea Tony Perez had a son who played in MLB. And he works for ESPN? Dude's Twitter header pic is him with Barak Obama which is cool. I think the dullest day of my adult life was the day I had jury duty a few years back. dammit scooter - the sign says "no pepper"! They showed us that movie when I was in (I think) 7th grade. I barely remember it though. My Mom loved old movies so I've seen most of the classics. I enjoyed 12 Angry Men. Great box for $12! Bogaerts' shot is outstanding. Unfortunately Topps chose one of their worst designs to use the pic. Very interesting story about your time on guard duty. So not surprised that you left a note in the suit pocket. Actually, I am surprised you didn't slip toilet paper in there. When I got home from Iraq in 2005, I went to FedEx to apply for a job as a dockworker after an in-law referred me. When I showed up, they were closed down due to a holiday, but the security guard hired me on the spot to work for his company (I think he wanted some holiday time off). I showed up the next night; he took off his security guard jacket, I put it on, and I was a security guard for a few shifts until I got the job at FedEx. The truck drivers coming through showed me what to do as far as checking their documents and inspecting the trucks. There wasn't much to the job, so I spent a lot of my guard shifts on my laptop, playing whichever Civilization game was new at that time. I never have been one for watching movies, and the older ones just don't grab my attention. I know a lot of people who really get into that scene, but I just never connected with them. I've been to jury duty four or five times. Our county in MD works the same way. I've gotten within two numbers of being selected, but never have. Was on a grand jury back in the late 90s - once a month for six months. That was interesting, but it was just deciding if cases should go to trial or not.